Campbell River is located on the 50th parallel, along the east coast of Vancouver Island at Discovery Passage. As the 4th largest city on Vancouver Island, Campbell River is a gateway and service centre to the North half of the Island as well as the neighboring communities of Gold River and Tahsis to the West, and the Discovery Islands, including Quadra and Cortes, to the East. Self-dubbed as the Salmon Fishing Capital of the World, Campbell River is known for its world-class saltwater fishing, as well as other great recreational opportunities such as whale-watching, grizzly bear tours, and easy access to prime sailing destinations such as Desolation Sound. A busy deep-water marina accommodates water and float-plane traffic, and has been host to cruise ships traveling the Discovery Passage between Vancouver and Alaska. 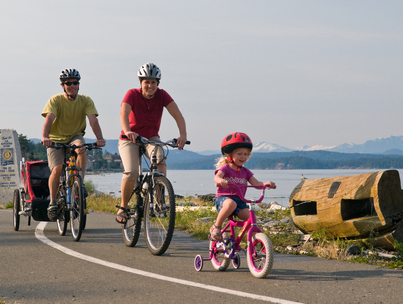 A paved sea walk allows cyclists, runners, or anyone out for a stroll easy access to the beautiful shoreline. Provincial parks such as Strathcona and Elk Falls offer excellent camping and hiking, as well as thundering waterfalls, pristine lakes and forests. Campbell River can be easily accessed by land or air. It is a two hour drive north from Nanaimo, where BC Ferries has two terminals to serve passengers traveling to or from Vancouver. Victoria is just under a four hour drive to the south, where ferries operate to and from Vancouver as well as Seattle, Washington. Daily scheduled flights arrive at Campbell River and District Regional Airport (YBL) from Vancouver International Airport (YVR) and other areas (Central Mountain Air, Pacific Coastal Airline). Campbell River has its own transit service, which includes separate door-to-door services for disabled users. Besides a prime seaside location and outstanding recreational activities, Campbell River has all the amenities of a big city, with a friendly small-town community spirit.